The Adventures of Maui Don - Dolphin Dude: Yer Out! 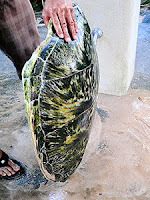 Strike One: When we got to the beach for our weekly Sunday swim, a local guy was washing the guts out of a (endangered species) turtle shell at the public shower. He said he found the shell on the beach already empty and that "Micronesians caught it last night and took all the meat." Which meant, of course, that any parts they didn't want had been thrown back into the ocean at our swimming area. Strike Two: The water was incredibly murky from recent high surf and visibility was nil. Any sharks which might have been feeding on turtle guts wouldn't know what we were until too late. For us. Strike Three: Fortunately, there was no strike three for us today. Bowing to group pressure, I swam anyway. The water cleared up a bit, but only a bit, after we got out quite a ways. Several people turned back early (smart, very smart people) and several more just a little later. Idiots that we were, we kept going. We didn't see anything, threatening or otherwise, because we couldn't see anything. We could barely see each other. I promise, next time I will "just say no!" Click HERE for the few other photographs from this morning's swim.